The overall format refers to Anabaena sp. cyanobacyeria. Cyanobacteria were the key organisms to turn our atmosphere oxygen rich. 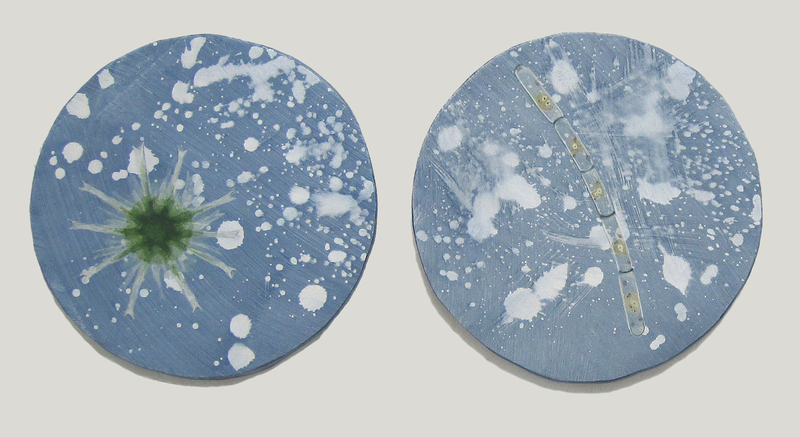 The separate plates show different plankton algae photographed/seen through a microscope. All water samples were taken in KilpisjÃ¤rvi area. On one plate the genetic information of cytochrome c6 coding gene is presented as colour matrix. Cytochrome c6 is a small protein participating in the electron transfer during photosynthesis. Black pearls refer to a fairy tail about white pearls turning into black when a person wearing them behave ethically badly. The pearls turn back to white when he or she is doing good. Anu Osva (FI) is an artist with scientific background in animal genetics. She worked ten years as a researcher, but chose to pursue an artistic career in 1990. In 1999 she began to combine scientific, especially genetic related thinking and observations into her artistic work. In 2008 she was elected as the first chair person Bioart Society with the goal to develop artists and researchers cooperation at the Kilpisjärvi Biological Station (Helsinki University).